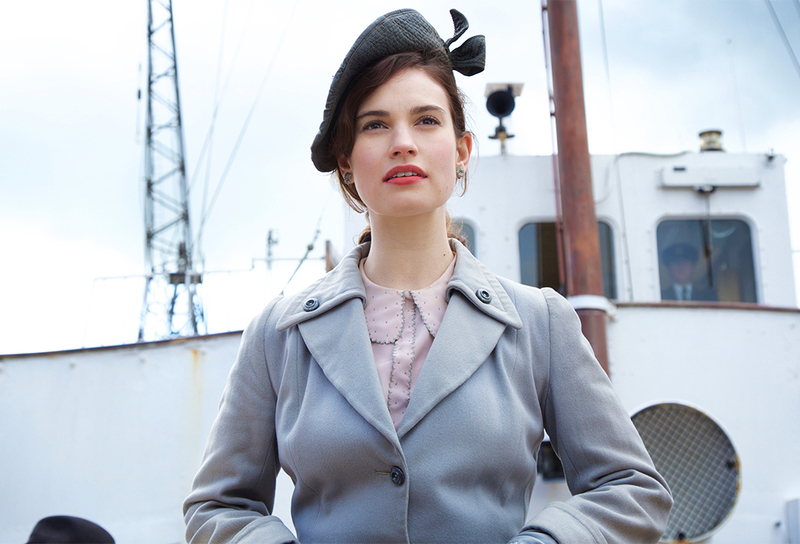 “Is it possible for us to belong to someone before we have met them”, is one of the thought provoking lines in the script for The Guernsey Literary and Potato Peel Pie Society a film by Mike Newell (Four Weddings and a Funeral) distributed by Studio Canal, starting in Australian cinemas on April 19, 2018. 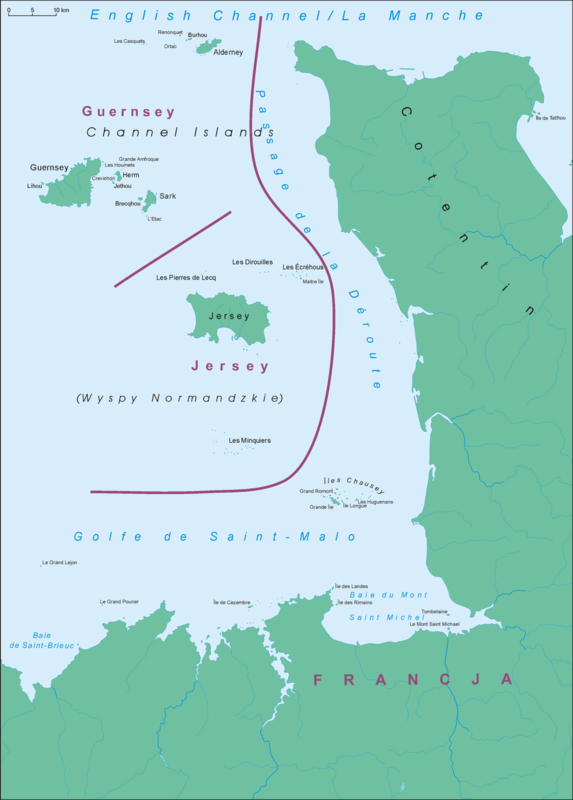 Guernsey is one of the major islands in the cluster known only since 1830 collectively as the Channel Islands, situated in the famous English Channel nearer to Normandy France than the English coast. Occupied by the Germans during World War II, while the islands are not part of the United Kingdom, Britain is responsible for their defense and international relations. During the horrors of the occupation both islanders and the slaves brought to the island by the German war machine, were starved and deprived of fresh food and nourishment. The Germans confiscated the islander’s livestock, ruined their livelihoods, performed unspeakable acts, experimented medically on human beings and ordered local farmers about the type of crops they were allowed to grow. The islanders all lived from 1940 – 1945 under harsh rules and strict guidelines, which they were tempted to break, with often horrific results. One small group of citizens, who had a love of books, proved they have the power to nourish the head and heart and to bring people together in times of crisis. 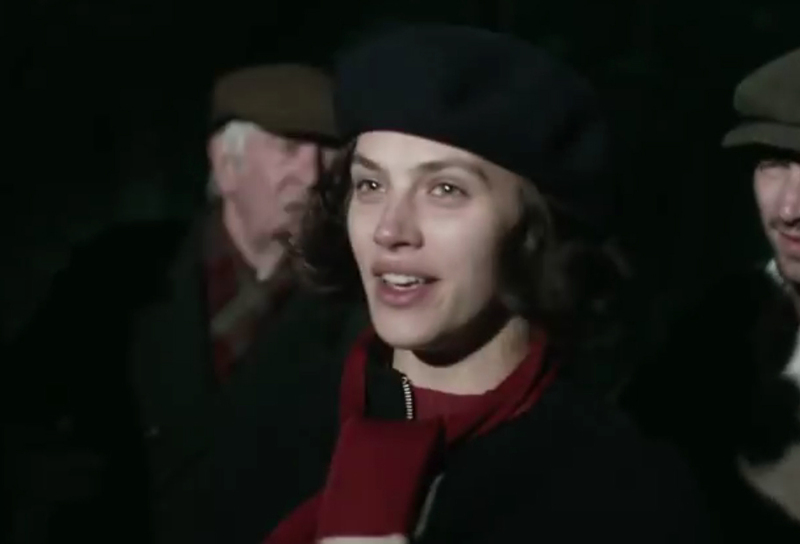 Trying to return to their homes quietly after curfew, one of their number Elizabeth McKenna (Jessica Brown Findlay) quick-wittily faces down the German patrol that surprises them. She tells them how they were all at a meeting of their ‘book reading club’, giving it the name we all admire on the spur of the moment. As the Germans are trying to ‘encourage cultural events’ they add it to their list of regular events giving their permission for it to happen. On this first occasion the members of the new society may have been discussing books they like but the main purpose of their gathering was having a feast together; they had slaughtered and cooked a pig kept hidden from the Germans for some time. Starving they had fallen on the luxurious crackling of the roast pork, which was accompanied by a pie made by Eben Ramsey (Tom Courtenay). He had invented it; a combination of mashed potato (without the luxury of adding butter or milk) dressed with a coating of plain ‘potato peelings’ – ensuring The Guernsey Literary and Potato Peel Pie Society was born. 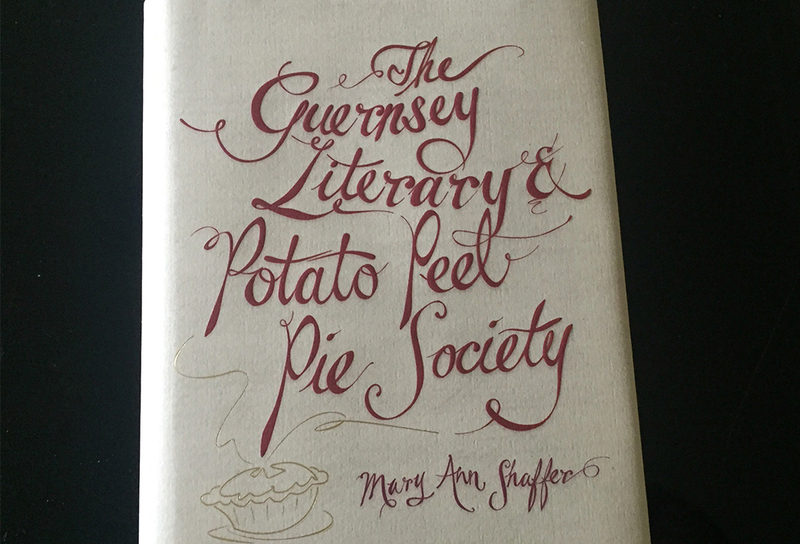 Adapted from the wondrous novel written by the late Mary Anne Schaeffer with help from her niece Annie Barrows, who completed this well-loved work in 2008 when her aunt became ill, the story of The Guernsey Literary and Potato Peel Pie Society was originally told in a series of letters. The screenplay for this wondrous film has great depth, wonderful sincerity and is driven by the very appealing diversity of the characters the story brings together. The attention to detail with the settings in 1946 is more than impressive, taking you back to that period of time just post war when people were finally beginning to be able to acquire some rations. They wanted to feel optimistic again, seeking to build their lives again after so much heartache, loss and sadness. There was hardly a family on the islands left unscathed, sporting scars that made hearts weighed down by being so full of despair and distress, hard to mend again, let alone help them to find a way without professional help to kick start their lives again and move forward. 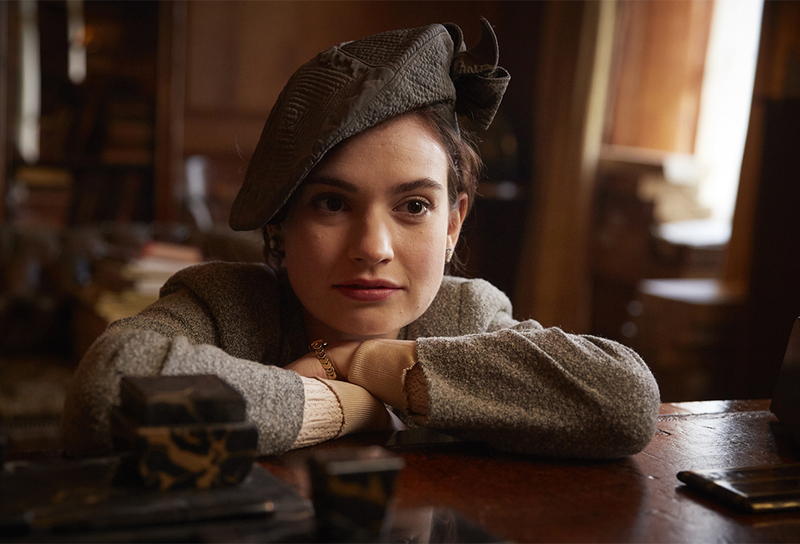 For this one small group however, it is when the quick witted, London based writer Juliet Ashton (Lily James) arrives on the scene, that their lives begin to change. In her early 30’s, Juliet has heard about the ‘Society’ and its many exploits after receiving a letter from one of its members, Dawsey Adams (Michiel Huisman). He had acquired on Guernsey a book she had once owned and found her name and address written on the inside cover. Desperate for some new reading material for he and his friends, and unable to travel to London, Dawsey writes to Juliet to ask her advice on how and where to secure the books he wants. Touched and intrigued by his chatty letter, she goes out searching for the book he wants and when she finds a copy, sends it off to him as a present. From that time onward a regular correspondence between them both begins and he urges other members of the society to also write to Juliet as well. Juliet has recently enjoyed some success as a writer with a lighthearted book published by Sophie her best friend from childhood’s older brother, Sidney Stark (Matthew Goode). Knowing him too for such a long time, she looks to him for wise and steady sage advice, especially since her parents were both lost as their London flat was bombed when she was not at home. Sidney has recently secured a writing job for Juliet from The Times in London and she is on the lookout for a suitable story when Dawsey Adam’s letter arrives. She becomes fascinated first, then inspired and excited. The resultant conversations she has with him by letter, prompted by her initial reply, are all ease and purpose. Soon she becomes keen to write a piece about the society that will ensure future readers of her work will take her seriously as an author. 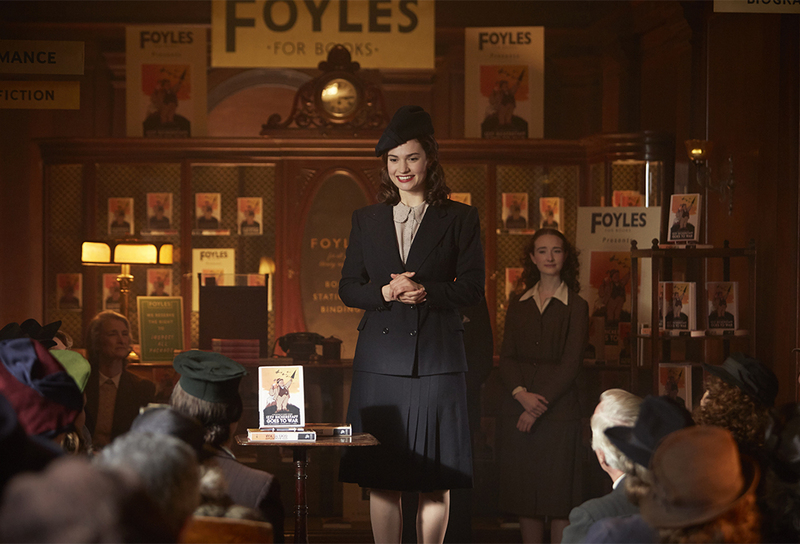 Juliet likes all the circumstances attached to the formation of The Guernsey Literary and Potato Peel Pie Society and she thinks it maybe just what she needs, the right story for what are very reflective times. She’s currently keeping company with a London based American publisher Mark Reynolds (Glen Powell) who is also on the lookout for a trophy wife. In a heightened mood of happiness and expectation, she splurges on an apricot dress gazed at in a local shop window for a long time, which he is completely dazzled by. Juliet just as impulsively decides to dash off to Guernsey for the coming long weekend without Mark, and without telling her new friends from the society, she’s coming to attend their Friday night meeting. She doesn’t expect Mark to come and see her off, but as she boards the boat he turns up, kneels down and proposes, dazzling her with a blinding diamond ring to wear. It’s clear he’s worried she may not return. She says yes, but we can tell her heart’s not really in it, especially when she removes the bling and ties it into a handkerchief and tucks it away in her purse. She’s totally concentrating on the exciting journey she’s about to make, one that will change forever the ‘arc’ of her life through learning about the courage of others. Juliet cannot help herself, she’s been on the lookout for something with meaning in her life and soon she falls in love with all her newfound friends on Guernsey, as well as the simply daily life they all lead. She receives the reward of feeling satisfied for the first time with who she is and what she has achieved while learning to fully understand the intent of Winston Churchill’s great quote “We make a living by what we get, we make a life by what we give”. Juliet and Dawsey soon find they have a powerful connection. Discovering a lot more about the society’s founder Elizabeth McKenna, although they never meet, Juliet realises it is her story at the heart and soul of the society. She feels compelled to search it out and decides to stay longer than she first thought, much to Mark’s annoyance back in London. Pretty soon the members of the society are pleased she is there too, because she has a rare gift of bonhomie; she has a way about her that encourages them to unburden their aching hearts to a compassionate ear willing to listen. The English landscape is always alluring, which is as the great garden designers of the eighteenth century intended. The setting is so appealing the whole audience, certainly my companion and I would have left to live on Guernsey at a moment’s notice (except it was filmed in various locations all over England, many in Devon) – well, you know what I mean! It is very seductive. Vintage award-winning actor Tom Courtenay plays Eben Ramsay, alongside young Kit Connor as Eli Ramsay. 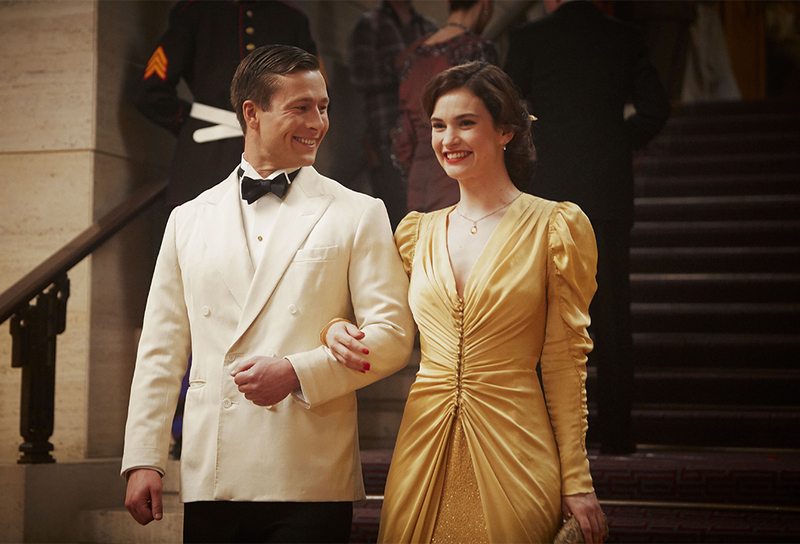 Matthew Goode is Sidney Stark and Glen Powell is Mark Reynolds. They all become anchors for the storyline. Penelope Wilton is truly outstanding as Amelia Maugery, a woman who has bottled up all her grief only to find she will not begin to heal until she lets go of the terrible story, not keeping it as she has, as a great weight of hate in her heart. Katherine Parkinson is the effervescent Isola Pribby whom the kind and generous Juliet befriends. She has been kept busy keeping everyone’s spirits up throughout the occupation and beyond, with her especially flavoured herbally flavoured ‘gin’. 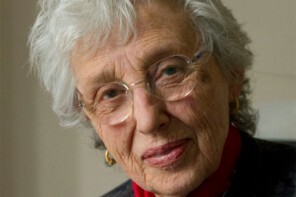 Her optimistic view of life has helped and still does, keep everyone going. This is an often dramatically intense and deeply satisfying film; superbly photographed, beautifully costumed, strikingly set, wonderful to look at and acted stylishly by a truly stunning ensemble cast. 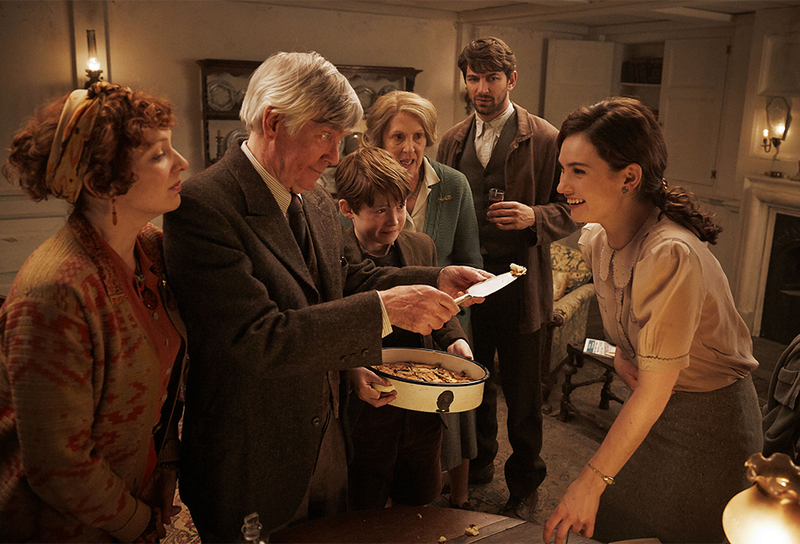 The Guernsey Literary and Potato Peel Pie Society is sure to rank highly in the awards this year. We don’t want to record too many spoilers; suffice to say this is a compelling film about great integrity and love. Modern manners, codes of behaviour, decorum and rules of etiquette matter in every culture and society – they illuminate and respect the human experience.